Three spatial dimensions are visible all around us--up/down, left/right, forward/backward. Add time to the mix, and the result is a four-dimensional blending of space and time known as spacetime. Thus, we live in a four-dimensional universe. Or do we? Amazingly, some new theories of physics predict that one of the three dimensions of space could be a kind of an illusion--that in actuality all the particles and fields that make up reality are moving about in a two-dimensional realm like the Flatland of Edwin A. Abbott. Gravity, too, would be part of the illusion: a force that is not present in the two-dimensional world but that materializes along with the emergence of the illusory third dimension. Or, more precisely, the theories predict that the number of dimensions in reality could be a matter of perspective: physicists could choose to describe reality as obeying one set of laws (including gravity) in three dimensions or, equivalently, as obeying a different set of laws that operates in two dimensions (in the absence of gravity). Despite the radically different descriptions, both theories would describe everything that we see and all the data we could gather about how the universe works. We would have no way to determine which theory was really true. The holographic description is more than just an intellectual or philosophical curiosity. A computation that might be very difficult in one realm can turn out to be relatively straightforward in the other, thereby turning some intractable problems of physics into ones that are easily solved. For example, the theory seems useful in analyzing a recent experimental high-energy physics result. Moreover, the holographic theories offer a fresh way to begin constructing a quantum theory of gravity--a theory of gravity that respects the principles of quantum mechanics. A quantum theory of gravity is a key ingredient in any effort to unify all the forces of nature, and it is needed to explain both what goes on in black holes and what happened in the nanoseconds after the big bang. The holographic theories provide potential resolutions of profound mysteries that have dogged attempts to understand how a theory of quantum gravity could work. A QUANTUM THEORY of gravity is a holy grail for a certain breed of physicist because all physics except for gravity is well described by quantum laws. The quantum description of physics represents an entire paradigm for physical theories, and it makes no sense for one theory, gravity, to fail to conform to it. Now about 80 years old, quantum mechanics was first developed to describe the behavior of particles and forces in the atomic and subatomic realms. It is at those size scales that quantum effects become significant. In quantum theories, objects do not have definite positions and velocities but instead are described by probabilities and waves that occupy regions of space. In a quantum world, at the most fundamental level everything is in a state of constant flux, even empty space, which is in fact filled with virtual particles that perpetually pop in and out of existence. In contrast, physicists best theory of gravity, general relativity, is an inherently classical (that is, nonquantum) theory. Albert Einstein's magnum opus, general relativity explains that concentrations of matter or energy cause spacetime to curve and that this curvature deflects the trajectories of particles, just as should happen for particles in a gravitational field. General relativity is a beautiful theory, and many of its predictions have been tested to great accuracy. In a classical theory such as general relativity, objects have definite locations and velocities, like the planets orbiting the sun. One can plug those locations and velocities (and the masses of the objects) into the equations of general relativity and deduce the curvature of spacetime and from that deduce the effects of gravity on the objects trajectories. Furthermore, empty spacetime is perfectly smooth no matter how closely one examines it--it is a seamless arena in which matter and energy can play out their lives. The problem in devising a quantum version of general relativity is not just that on the scale of atoms and electrons, particles do not have definite locations and velocities. To make matters worse, at the even tinier scale delineated by the Planck length (1033 centimeter), quantum principles imply that spacetime itself should be a seething foam, similar to the sea of virtual particles that fills empty space. When matter and spacetime are so protean, what do the equations of general relativity predict? The answer is that the equations are no longer adequate. If we assume that matter obeys the laws of quantum mechanics and gravity obeys the laws of general relativity, we end up with mathematical contradictions. A quantum theory of gravity (one that fits within the paradigm of quantum theories) is needed. In most situations, the contradictory requirements of quantum mechanics and general relativity do not cause a problem, because either the quantum effects or the gravitational effects are so small that they can be neglected or dealt with by approximations. When the curvature of spacetime is very large, however, the quantum aspects of gravity become significant. It takes a very large mass or a great concentration of mass to produce much spacetime curvature. Even the curvature produced near the sun is exceedingly small compared with the amount needed for quantum gravity effects to become apparent. Although these effects are completely negligible now, they were very important in the beginning of the big bang, which is why a quantum theory of gravity is needed to describe how the big bang started. Such a theory is also important for understanding what happens at the center of black holes, because matter there is crushed into a region of extremely high curvature. Because gravity involves spacetime curvature, a quantum gravity theory will also be a theory of quantum spacetime; it should clarify what constitutes the spacetime foam mentioned earlier, and it will probably provide us with an entirely new perspective on what spacetime is at the deepest level of reality. A very promising approach to a quantum theory of gravity is string theory, which some theoretical physicists have been exploring since the 1970s. String theory overcomes some of the obstacles to building a logically consistent quantum theory of gravity. String theory, however, is still under construction and is not yet fully understood. That is, we string theorists have some approximate equations for strings, but we do not know the exact equations. We also do not know the guiding underlying principle that explains the form of the equations, and there are innumerable physical quantities that we do not know how to compute from the equations. In recent years string theorists have obtained many interesting and surprising results, giving novel ways of understanding what a quantum spacetime is like. I will not describe string theory in much detail here but instead will focus on one of the most exciting developments emerging from string theory research, which has led to a complete, logically consistent, quantum description of gravity in what are called negatively curved spacetimes. For these spacetimes, holographic theories appear to be true. ALL OF US are familiar with Euclidean geometry, where space is flat (that is, not curved). It is the geometry of figures drawn on flat sheets of paper. To a very good approximation, it is also the geometry of the world around us: parallel lines never meet, and all the rest of Euclid's axioms hold. We are also familiar with some curved spaces. Curvature comes in two forms, positive and negative. The simplest space with positive curvature is the surface of a sphere. A sphere has constant positive curvature. That is, it has the same degree of curvature at every location (unlike an egg, say, which has more curvature at the pointy end). The simplest space with negative curvature is called hyperbolic space, which is defined as space with constant negative curvature. This kind of space has long fascinated scientists and artists alike. Indeed, M. C. Escher produced several beautiful pictures of hyperbolic space, one of which is shown on the preceding page. His picture is like a flat map of the space. The way that the fish become smaller and smaller is just an artifact of how the curved space is squashed to fit on a flat sheet of paper, similar to the way that countries near the poles get stretched on a map of the globe (a sphere). By including time in the game, physicists can similarly consider spacetimes with positive or negative curvature. The simplest spacetime with positive curvature is called de Sitter space, after Willem de Sitter, the Dutch physicist who introduced it. Many cosmologists believe that the very early universe was close to being a de Sitter space. The far future may also be de Sitterlike because of cosmic acceleration. Conversely, the simplest negatively curved spacetime is called antide Sitter space. It is similar to hyperbolic space except that it also contains a time direction. Unlike our universe, which is expanding, antide Sitter space is neither expanding nor contracting. It looks the same at all times. Despite that difference, antide Sitter space turns out to be quite useful in the quest to form quantum theories of spacetime and gravity. If we picture hyperbolic space as being a disk like Escher's drawing, then antide Sitter space is like a stack of those disks, forming a solid cylinder [see box above]. Time runs along the cylinder. Hyperbolic space can have more than two spatial dimensions. The antide Sitter space most like our spacetime (with three spatial dimensions) would have a three-dimensional Escher print as the cross section of its cylinder. Physics in antide Sitter space has some strange properties. If you were freely floating anywhere in antide Sitter space, you would feel as though you were at the bottom of a gravitational well. Any object that you threw out would come back like a boomerang. Surprisingly, the time required for an object to come back would be independent of how hard you threw it. The difference would just be that the harder you threw it, the farther away it would get on its round-trip back to you. If you sent a flash of light, which consists of photons moving at the maximum possible speed (the speed of light), it would actually reach infinity and come back to you, all in a finite amount of time. This can happen because an object experiences a kind of time contraction of ever greater magnitude as it gets farther away from you. ANTI-DE SITTER SPACE, although it is infinite, has a boundary, located out at infinity. To draw this boundary, physicists and mathematicians use a distorted length scale similar to Escher's, squeezing an infinite distance into a finite one. This boundary is like the outer circumference of the Escher print or the surface of the solid cylinder I considered earlier. In the cylinder example, the boundary has two dimensions--one is space (looping around the cylinder), and one is time (running along its length). For four-dimensional antide Sitter space, the boundary has two space dimensions and one time dimension. Just as the boundary of the Escher print is a circle, the boundary of four-dimensional antide Sitter space at any moment in time is a sphere. This boundary is where the hologram of the holographic theory lies. Stated simply, the idea is as follows: a quantum gravity theory in the interior of an antide Sitter spacetime is completely equivalent to an ordinary quantum particle theory living on the boundary. If true, this equivalence means that we can use a quantum particle theory (which is relatively well understood) to define a quantum gravity theory (which is not). To make an analogy, imagine you have two copies of a movie, one on reels of 70-millimeter film and one on a DVD. The two formats are utterly different, the first a linear ribbon of celluloid with each frame recognizably related to scenes of the movie as we know it, the second a two-dimensional platter with rings of dots that would form a sequence of 0s and 1s if we could perceive them at all. Yet both describe the same movie. Similarly, the two theories, superficially utterly different in content, describe the same universe. The DVD looks like a metal disk with some glints of rainbowlike patterns. The boundary particle theory looks like a theory of particles in the absence of gravity. From the DVD, detailed pictures emerge only when the bits are processed the right way. From the boundary particle theory, quantum gravity and an extra dimension emerge when the equations are analyzed the right way. Here is the equivalence in more detail. The particles that live on the boundary interact in a way that is very similar to how quarks and gluons interact in reality (quarks are the constituents of protons and neutrons; gluons generate the strong nuclear force that binds the quarks together). Quarks have a kind of charge that comes in three varieties, called colors, and the interaction is called chromodynamics. The difference between the boundary particles and ordinary quarks and gluons is that the particles have a large number of colors, not just three. Gerard t Hooft of Utrecht University in the Netherlands studied such theories as long ago as 1974 and predicted that the gluons would form chains that behave much like the strings of string theory. The precise nature of these strings remained elusive, but in 1981 Alexander M. Polyakov, now at Princeton University, noticed that the strings effectively live in a higher-dimensional space than the gluons do. As we shall see shortly, in our holographic theories that higher-dimensional space is the interior of antide Sitter space. To understand where the extra dimension comes from, start by considering one of the gluon strings on the boundary. This string has a thickness, related to how much its gluons are smeared out in space. When physicists calculate how these strings on the boundary of antide Sitter space interact with one another, they get a very odd result: two strings with different thicknesses do not interact very much with each other. It is as though the strings were separated spatially. One can reinterpret the thickness of the string to be a new spatial coordinate that goes away from the boundary. Thus, a thin boundary string is like a string close to the boundary, whereas a thick boundary string is like one far away from the boundary [see box on preceding page]. The extra coordinate is precisely the coordinate needed to describe motion within the four-dimensional antide Sitter spacetime! From the perspective of an observer in the spacetime, boundary strings of different thicknesses appear to be strings (all of them thin) at different radial locations. The number of colors on the boundary determines the size of the interior (the radius of the Escher-like sphere). To have a spacetime as large as the visible universe, the theory must have about 1060 colors. It turns out that one type of gluon chain behaves in the four-dimensional spacetime as the graviton, the fundamental quantum particle of gravity. In this description, gravity in four dimensions is an emergent phenomenon arising from particle interactions in a gravityless, three-dimensional world. The presence of gravitons in the theory should come as no surprise. Thanks to work by John H. Schwarz of the California Institute of Technology and Jel Scherk of the cole Normale Suprieure and, independently, Tamiaki Yoneya of Hokkaido University in Japan, physicists have known since 1974 that string theories always give rise to quantum gravity. The strings formed by gluons are no exception, but the gravity operates in the higher-dimensional space. Thus, the holographic correspondence is not just a wild new possibility for a quantum theory of gravity. Rather, in a fundamental way, it connects string theory, the most studied approach to quantum gravity, with theories of quarks and gluons, which are the cornerstone of particle physics. What is more, the holographic theory seems to provide some insight into the elusive exact equations of string theory. String theory was actually invented in the late 1960s for the purpose of describing strong interactions, but it was later abandoned (for that purpose) when the theory of chromodynamics entered the scene. The correspondence between string theory and chromodynamics implies that these early efforts were not misguided; the two descriptions are different faces of the same coin. Varying the boundary chromodynamics theory by changing the details of how the boundary particles interact gives rise to an assortment of interior theories. The resulting interior theory can have only gravitational forces, or gravity plus some extra force such as the electromagnetic force, and so on. Unfortunately, we do not yet know of a boundary theory that gives rise to an interior theory that includes exactly the four forces we have in our universe. I first conjectured that this holographic correspondence might hold for a specific theory (a simplified chromodynamics in a four-dimensional boundary spacetime) in 1997. This immediately excited great interest from the string theory community. The conjecture was made more precise by Polyakov, Stephen S. Gubser and Igor R. Klebanov of Princeton, and Edward Witten of the Institute for Advanced Study in Princeton, N.J. Since then, many researchers have contributed to exploring the conjecture and generalizing it to other dimensions and other chromodynamics theories, providing mounting evidence that it is correct. So far, however, no example has been rigorously proved--the mathematics is too difficult. 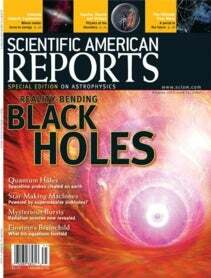 HOW DOES THE holographic description of gravity help to explain aspects of black holes? Black holes are predicted to emit Hawking radiation, named after Stephen Hawking of the University of Cambridge, who discovered this result. This radiation comes out of the black hole at a specific temperature. For all ordinary physical systems, a theory called statistical mechanics explains temperature in terms of the motion of the microscopic constituents. This theory explains the temperature of a glass of water or the temperature of the sun. What about the temperature of a black hole? To understand it, we would need to know what the microscopic constituents of the black hole are and how they behave. Only a theory of quantum gravity can tell us that. Some aspects of the thermodynamics of black holes have raised doubts as to whether a quantum-mechanical theory of gravity could be developed at all. It seemed as if quantum mechanics itself might break down in the face of effects taking place in black holes. For a black hole in an antide Sitter spacetime, we now know that quantum mechanics remains intact, thanks to the boundary theory. Such a black hole corresponds to a configuration of particles on the boundary. The number of particles is very large, and they are all zipping around, so that theorists can apply the usual rules of statistical mechanics to compute the temperature. The result is the same as the temperature that Hawking computed by very different means, indicating that the results can be trusted. Most important, the boundary theory obeys the ordinary rules of quantum mechanics; no inconsistency arises. Physicists have also used the holographic correspondence in the opposite direction--employing known properties of black holes in the interior spacetime to deduce the behavior of quarks and gluons at very high temperatures on the boundary. Dam Son of the University of Washington and his collaborators studied a quantity called the shear viscosity, which is small for a fluid that flows very easily and large for a substance more like molasses. They found that black holes have an extremely low shear viscosity--smaller than any known fluid. Because of the holographic equivalence, strongly interacting quarks and gluons at high temperatures should also have very low viscosity. Many questions about the holographic theories remain to be answered. In particular, does anything similar hold for a universe like ours in place of the antide Sitter space? A crucial aspect of antide Sitter space is that it has a boundary where time is well defined. The boundary has existed and will exist forever. An expanding universe, like ours, that comes from a big bang does not have such a well-behaved boundary. Consequently, it is not clear how to define a holographic theory for our universe; there is no convenient place to put the hologram. An important lesson that one can draw from the holographic conjecture, however, is that quantum gravity, which has perplexed some of the best minds on the planet for decades, can be very simple when viewed in terms of the right variables. Let's hope we will soon find a simple description for the big bang! JUAN MALDACENA is a professor in the School of Natural Sciences at the Institute for Advanced Study in Princeton, N.J. From 1997 to 2001 he was in the physics department at Harvard University. He is currently studying various aspects of the duality conjecture described in this article. String theorists were so impressed with the conjecture that at the Strings 98 conference they feted him with a song, The Maldacena, sung and danced to the tune of The Macarena. Juan Maldacena is a theoretical physicist at the Institute for Advanced Study in Princeton, N.J. He is known for his contributions to the study of quantum gravity and string theory. In 2012 he received a Breakthrough Prize in Fundamental Physics.